Imagine the next time you're flying. You arrive at the gate. There's a big mob. It's going to be a crowded flight. A gate attendant announces that your flight is overbooked out and asks for volunteers. The airline needs a passenger to give up her seat -- and, as a lure, offers up a $300 travel voucher. That's not what happened on the now-infamous United (UAL) flight. 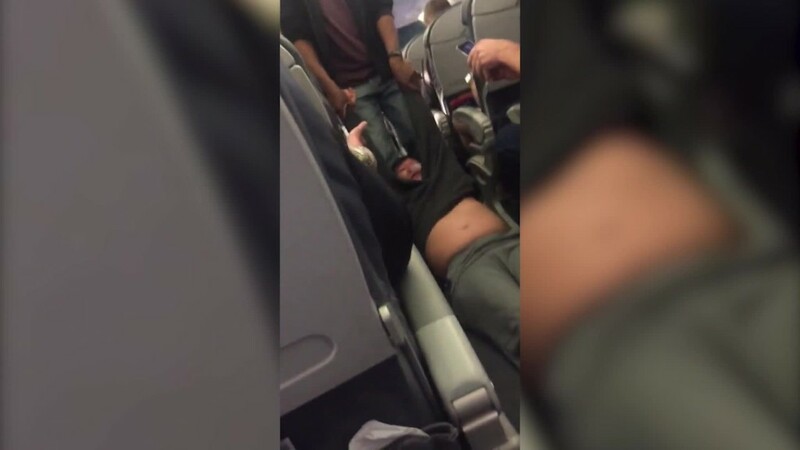 A passenger was dragged off the plane in Chicago by authorities when he refused to give up his seat, which the airline needed to fly one of its own staff to another city. United is now investigating how it handles overbooking situations and interacts with local law enforcement. The United incident was an outlier. But it's standard practice for airlines to overbook flights in anticipation of no-show passengers. There are also scenarios in which the plane may be too heavy, an air marshal needs to board or flight staff have to get to work. Long story short: If a carrier needs seats, it may have its eye on yours. As a flier, here's what you should know. The Department of Transportation requires that airlines ask for volunteers to switch flights before they kick anyone off. But negotiations are entirely between you and the carrier. Airlines dictate what the compensation looks like, but it's usually a travel voucher toward a future flight or a gift card. That may be totally fine. If you're cool with going to a different gate, getting to your final destination a little late and banking a flight credit, feel free to volunteer. You should know, though, that you aren't entitled to call up an airline and ask for more once you say yes to a deal. And if you're kicked off involuntarily, you're entitled to cash (see below). One quick addendum: If you get a voucher, the DOT recommends reading the fine print. You should inquire into how long the ticket voucher is good for, whether you can use it over the holidays and if it's good for international trips. When airlines don't get enough volunteers and must involuntarily bump passengers, there are rules they need to follow. Carriers must deliver fliers to their final destination within one hour of their originally scheduled flight -- or they have to start forking over money. If fliers get to their final stop one to two hours late (or one to four hours late if they're flying internationally), airlines are required to pay double the original one-way fare, with a $675 limit. If fliers get in more than two hours late (or four internationally), airlines have to pay 400% of the one-way fare, with a $1,350 limit. Passengers have the right to insist on a check instead of a free flight or a voucher when they're involuntarily kicked off a flight, according to the DOT. And they always get to keep their original ticket, which retains its value. Flying an airline that says it doesn't oversell? You still may want to be careful. Airlines set their own policies when it comes to the order in which passengers are bumped. The terms are also sketched out in those pesky contracts of carriage. On United flights, people with disabilities and unaccompanied minors should be the last to be kicked off, according to the company's contract. American Airlines says it denies boarding based on order of check-in, but will also weigh "severe hardships," ticket cost and status within the carrier's loyalty program. Delta Air Lines also considers check-in order and loyalty status and looks at if a passenger is slated to fly first or business class. The carrier also says it makes exceptions for people with disabilities, unaccompanied minors and members of the military. The DOT warns fliers that their bargaining power is the greatest before they cash in their reward for being involuntarily bumped -- whether it's a voucher or a check. "Once you cash the check (or accept the free flight), you will probably lose the ability to pursue more money from the airline later on," the DOT says on its website. If you the cost of being bumped exceeds what you were paid at the airport, you can always try to negotiate a higher settlement via the airline's complaint department, the agency says. And if that doesn't work, you can sue. "You are always free to decline the check (e.g., not cash it) and take the airline to court to try to obtain more compensation," according to the DOT.